years ago at Crate & Barrel. 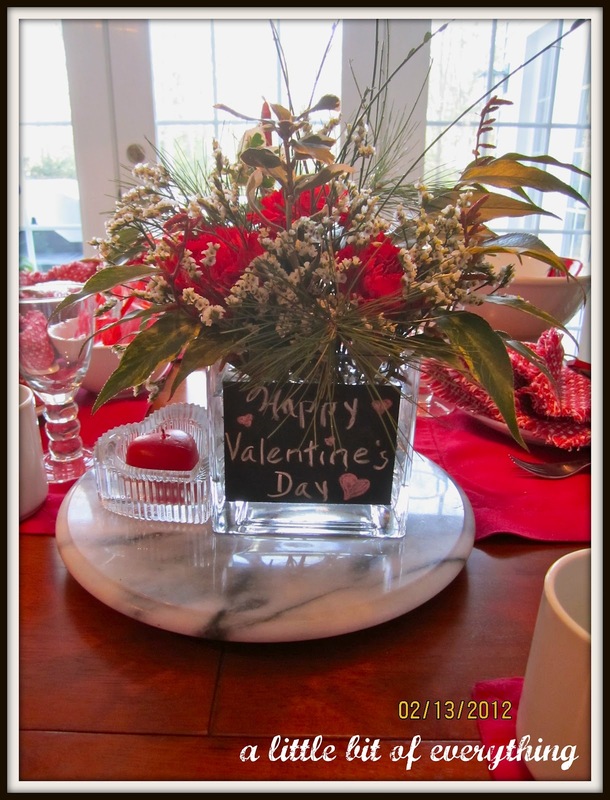 After purchasing red carnations and baby's breath I added greens from the yard to the chalkboard painted vase which served as the table centerpiece. What a beautiful and festive tablescape you have created for your lucky guests! Very nice! Thanks for linking up to Family Time Tuesday! Beautiful table setting. Happy Valentine's Day. Hope you will come share your talents on Friday at Bacon Time's Anything Goes linky. I'll be right there! I just found you thru TTT at Marty's. You have a great blog, I'm so happy I did...hope you visit me too. HAPPY VALENTINE'S DAY! What a lovely table! love love the chalkboard saucer with topiary! That is very lovely. The meal must be yummy. And a HAPPY Valentine's Day to YOU!!! Looks beautiful! I'm pinning this for next year. Your tablescape is gorgeous. I found you through the blog hop. I'm following via LF. Stop by www.thenymelrosefamily.blogspot.com and check me out. Pretty table -- and the vase is so clever. Wow, that is lovely! Wonderful job on the decor! Hi, I'm a new follower. I really enjoyed reading your blog. Please come by and visit me sometime. Have a great day. So lovely and festive! Thanks for sharing at our Shine on Friday party! New Linky and GFC follower! 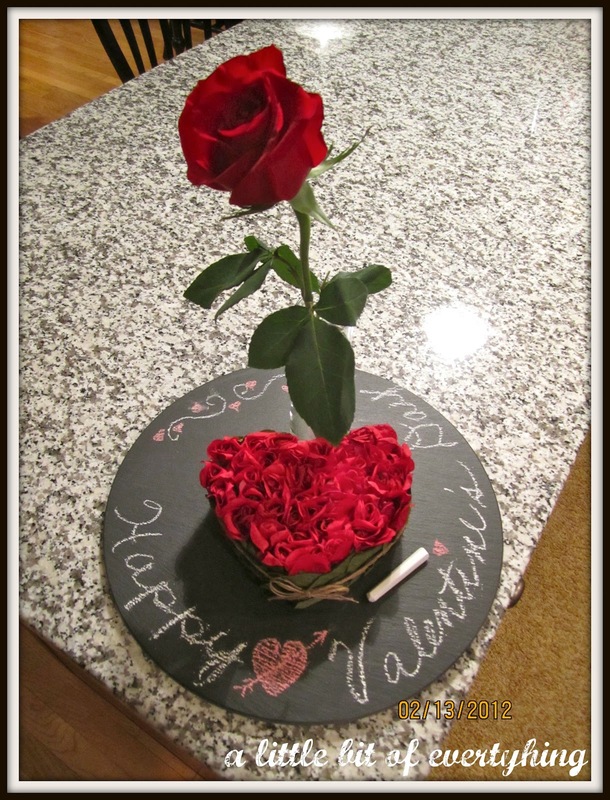 A very sweet and simple Valentine. 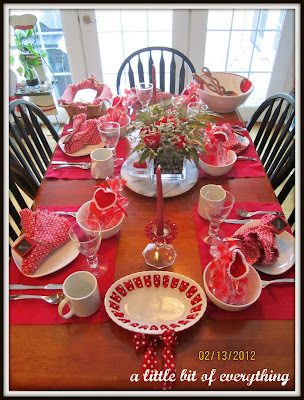 I love your table setting! Please come by and see mine which I hosted last Sat and one I just posted about today. I love Valentines! You've got a very sweet blog, Sugar! I'm just trying to visit one I've never been to before and yours is it today. Nice to meet you. Lovely table setting! I discovered you on Blog Hop and I'm now a follower, I would appreciate the same. Thanks. What a fabulously festive table! Thank you so much for sharing at Taking A Timeout Thursday! Oh, so nice! Will you, pretty please, consider sharing with my readers at http://sassafrassalvation.blogspot.com/2012/02/sasss-sunday-salvation-show-12.html ? This is so pretty, I love the chalkboard with the heart. I want to come over! Love your table! Red and white is always gorgeous. Especially perfect for Valentines! Thanks for sharing with SYC.